Black Friday Bitcoin Crypto Crash! Are All Cryptocurrencies Going To Zero? Peter Schill and the Health Ranger are finally right. They were right all along. The cryptocurrencies have all crashed and are headed towards zero. 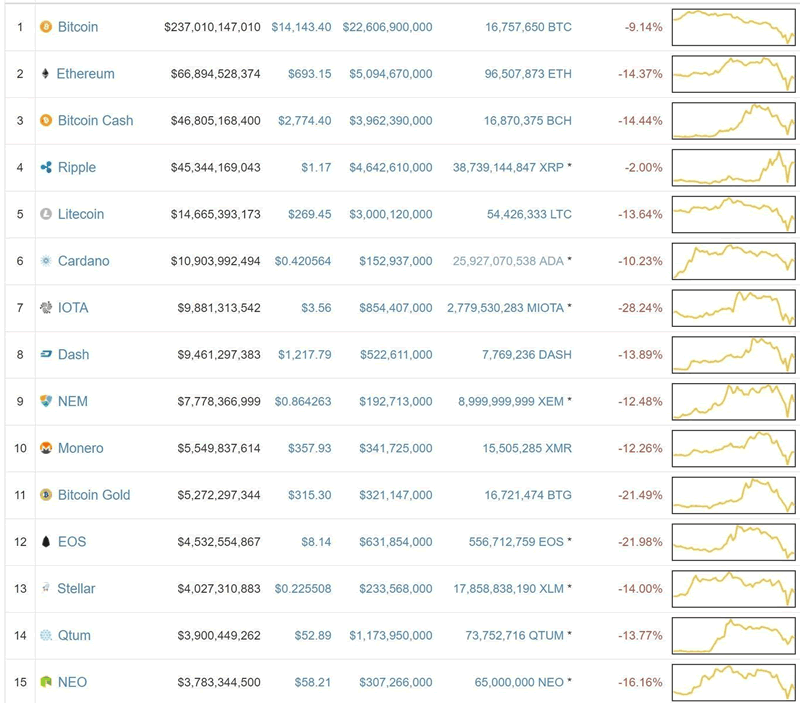 It was only a few days ago I commented that almost every cryptocurrency was in the green. Today was the exact opposite. 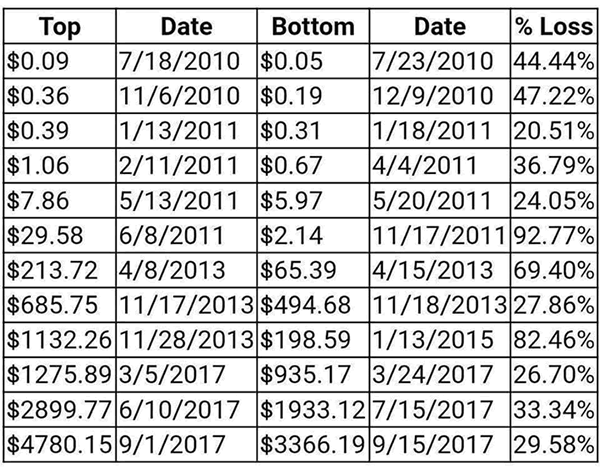 Cryptocurrencies hit an all-time high of $652 billion just a day ago and on Friday they hit a low of $423 billion for a one day loss of 35%. They have since recovered to $540 million. Bitcoin hit an all-time high just above $20,000 on December 17th and recorded a low at Coinmarketcap.com on Friday of $11,833 and is currently just above $14,000. That means bitcoin has slumped 40% since its high to the low and is currently 30% off its all-time high. Overall, bitcoin has fallen further than the rest of the sector quite dramatically in the last few days. But, wait, are Peter Schill and the Vitamin guy right? We are only down in the neighborhood of 30-40%. 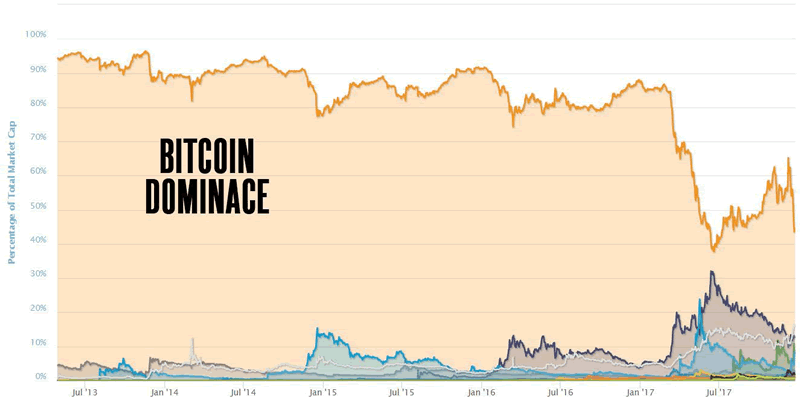 Bitcoin has actually fallen 30% five times this year already. So, on average, this happens every two months. And, during previous drops it was followed by an increase of 76%, 237%, 183%, 165% and 152% before it dropped again. So, is this latest drop all that extreme? Or unexpected? In fact, it wasn’t unexpected at all, by us here at TDV. Less than 24 hours later and bitcoin hit Ed’s target low almost exactly. And, as you know, I have been suggesting taking profits on bitcoin and the cryptos since bitcoin soared over $15,000. And Ed reiterated that in his alert yesterday, saying, “we still highly recommend rebalancing your portfolio and reducing your crypto exposure a little." So, we will see how this most recent pullback plays out. 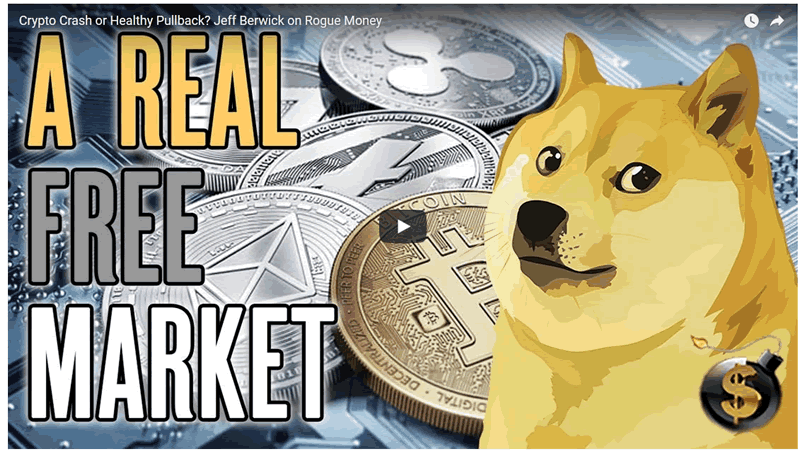 In this interview I did today with Rogue Money I discuss where things could be headed. For now, this looks like a completely ordinary pullback after a massive run higher. And, a healthy and needed pullback at that. Perhaps bitcoin and the cryptos are giving everyone an early 30% off Christmas present. If this was Black Friday and it was 30% off DVD players at Walmart, millions of American sheeple would climb over each other to get it. But, when cryptos are 30% off? For some reason, people have the opposite reaction to retail goods and they are too scared to buy. For all those who had been waiting for the dip to buy... this is the dip. And, on December 24th at 12pm Eastern time I’ll be revealing my next cryptocurrency pick to TDV Premium subscribers (you can subscribe or upgrade from Basic HERE). It has fallen about 30% along with all the other cryptos in the last few days… so, if that doesn’t change by Sunday you may get it at a bargain. For now, HODL on, everyone. Excellent article, you have really captured the seductive nature of exponential bubbles. What would be a catastrophic drop for any other asset is just a regular pull-back for a technical bubble, as the price drives its way to the top. Despite the pull-back last week I expect the price to continue on higher to even more insane levels before the bubble top is recorded and the bubble really does burst. I'm looking at a Bitcoin top price of between 21,500 and 22,650 in coming weeks. There is a top signal forming around the end of January (not yet fully formed, but its close) and that suggests a top in Bitcoin forming sometime between the end of January and the end of April. I'm looking at a particular pattern that is predictive, that is to say it's different from other technical analysis that tells you what has happened in the past, instead my approach predicts what is going to happen over coming weeks and months. It's a combination of quantitative analysis and predictive analytics with some pattern recognition thrown in for good measure. Once the bubble bursts we are looking at a huge drop in price that will burn most investors. Previously my model was predicting a drop of 70% to 80%, but I'm revising that a little more today to be a 75% to 90% drop from top to bottom. The lucky ones who get out at the top will walk away with a fortune, however, the rest will walk away nursing their wounds (and counting their huge losses) and thinking to themselves how could they have been seduced so easily to throw so much cash away. Think Tulips! Think dot com bubble! Old or new there are countless examples in history where the same manic investing happens. Those who don't study history are doomed to repeat it.